The City of Toronto has proclaimed September 15, 2017, as Toronto’s first official Urban Agriculture Day; and if you know anything about the abundance of good food projects in the city, you know there’s plenty to celebrate. 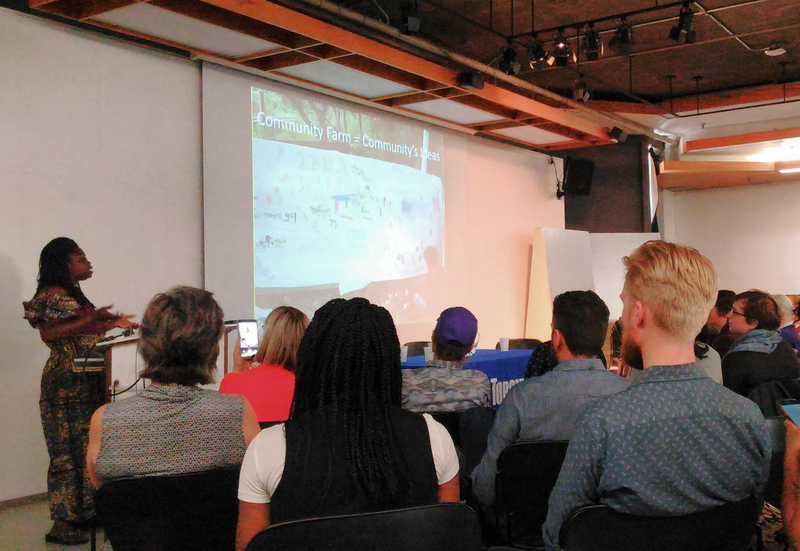 Thus, there have been events celebrating the power of urban ag in Toronto all week, showcasing the extensive impact it achieves, and, consequently, some of the incredible people who make it all happen. 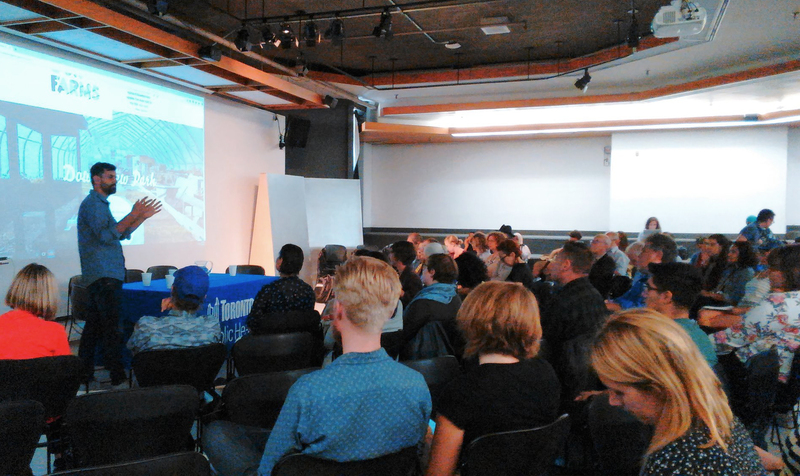 On Wednesday, September 13, the Toronto Food Policy Council hosted a public forum downtown at Ryerson University, Growing in the City, which highlighted some of these innovative projects that have sprouted up across the city, with stories that prove urban agriculture gleans much more than fresh food. The four presentations powerfully demonstrated that urban ag has the capacity to not just grow nutritious food close to home and nourish residents, but to also empower individuals and communities, create jobs, turn peoples’ lives around for the better, and significantly support efforts surrounding food security, poverty reduction, economic development, environmental health, and, of course, public health. 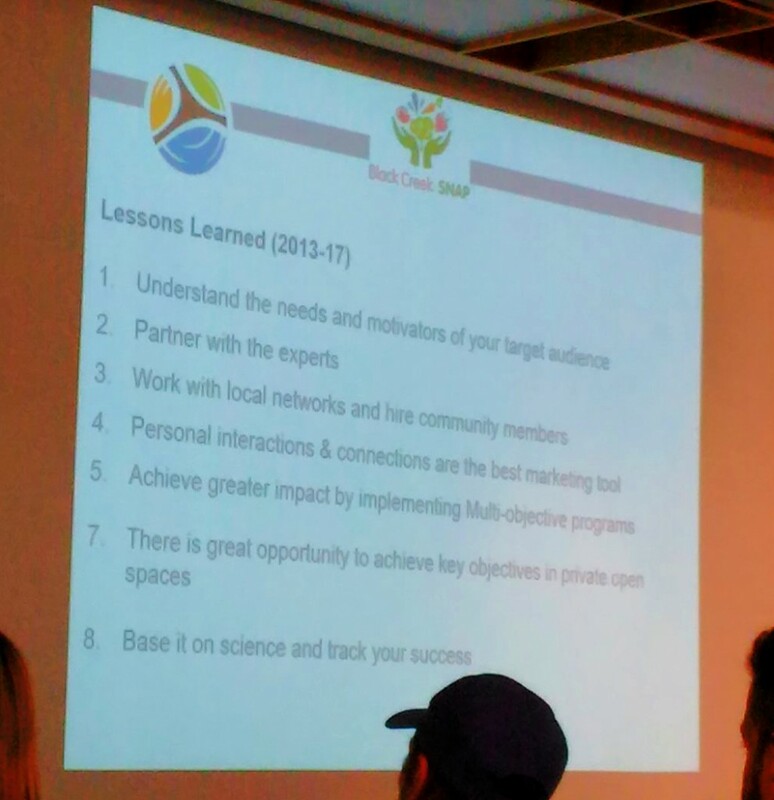 The Toronto and Region Conservation’s Black Creek SNAP program, presented by Adriana Gomez and Holly Shaw-Lopez, shows how a neighbourhood can work together to strengthen food security through a number of engaging avenues — from an urban orchard and an intergenerational skills sharing program, to backyard sharing, 148 balcony gardens, surplus harvest donations, and so much more. Leticia Boahen, Director of Black Creek Community Farm (the largest urban farm in Toronto), then detailed some of their programming that empowers community members through food: a youth leadership program, farm camps for kids, a seniors program, and a harvest share program, just to name a few, all which offer subsidies for families or low-income neighbours. Fresh City Farms and Founder Ran Goel brought the perspective of a for-profit farm, which requires the same commitment and passion when facing institutional barriers (e.g. leasing land); Ran spoke openly about some of these struggles and the lessons learned in starting such a project. Now seven years in, the farm located at Downsview Park is Canada’s largest commercial city farm, and its success has offered an entrepreneurial platform for member farmers, while growing and delivering nutritious food throughout the city. 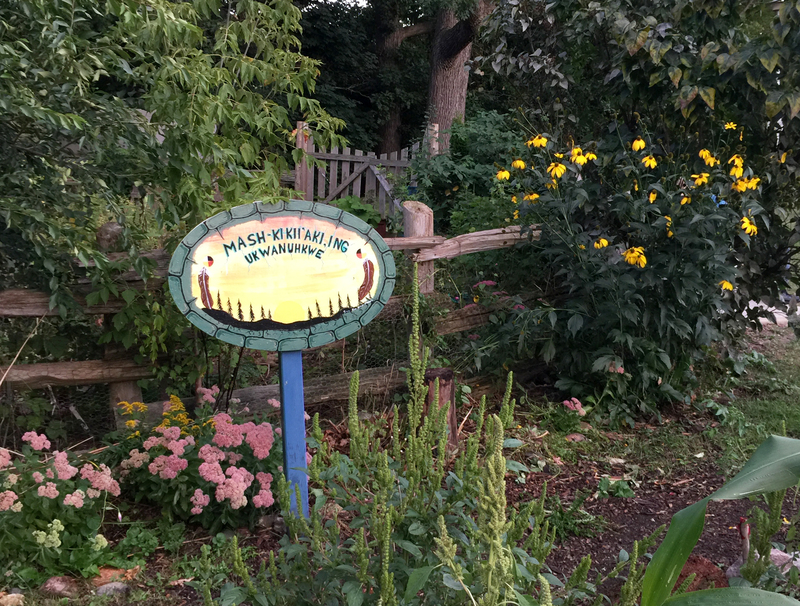 Joce Tremblay offered insight into the Mashkikii;aki’ing Garden, a medicine wheel garden, Toronto’s first Aboriginal community garden. Now in their 8th season working with the Stop Community Food Centre, the garden gives men of the Apaenmowineen program the opportunity to share teachings and learn more about plant medicine, gardening and healthy living that can lead to healing. Learn more about all of these projects through their respective links above, and you’ll be sure to appreciate how urban agriculture achieves community transformation and growth through immeasurable ripple effects. Good food is, without a doubt, a vehicle for change. The forum also emphasized the fact that this work happens because of activists and supporters, many in the room—like Fiona Nelson—who, for over a quarter of a century, have been talking about and advocating for good food. Community activist, educator, gardener, and woman extraordinaire, Fiona helped create the Toronto Food Policy Council, which has established the city worldwide as a leader in municipal food policy. After a remarkable 26 years with the Council, Fiona is retiring. 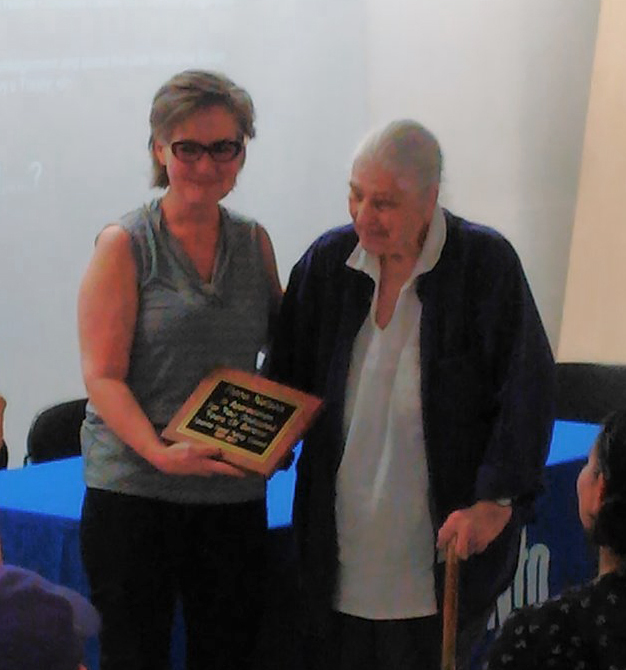 The packed room paid tribute to her at the end of the forum with a plaque, cake and standing ovation. A friend to farmers urban and rural, Fiona was also a long-time member of the Greater Toronto Area Agriculture Action Committee. In her thanks on Wednesday, she addressed the dedication, commitment and passion that is required for this sort of work, pointing out how hopeful it is to still see such enthusiasm around food. The Toronto Food Policy Council was established in 1991 as a subcommittee of the Board of Health to advise the city on food policy issues. Many players have been advocating for and supporting food policy and urban agriculture for years; and for over a century, Fiona added, the Toronto Board of Health has showed interest in this work too.